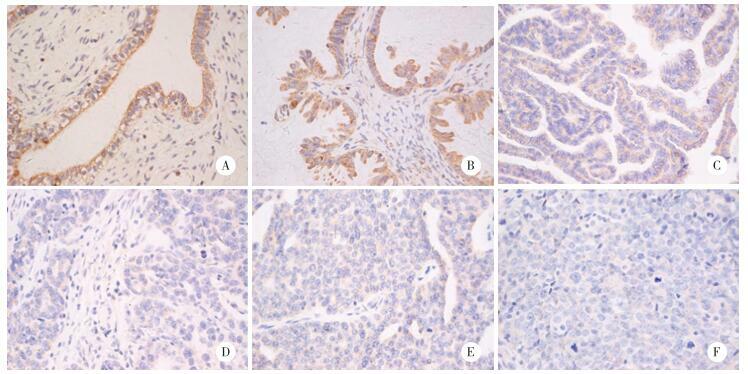 Abstract: Objective To investigate the expression of dual-specificity phosphatase 6(DUSP6) in ovarian epithelial serous tumors and the relationship between DUSP6 expression and the clinicopathological parameters of ovarian serous cystoadenocarcinoma.Methods The expression of DUSP6 was analyzed by immunohistochemistry. Relationships between the expression of DUSP6 and the clinicopathological parameters of ovarian serous cystadenocarcinoma were also analyzed.Results DUSP6 expression was lower in patients with ovarian serous cystadenocarcinoma group with serum CA125 levels of less than or equal to 900 U/mL than in patients with serum CA125 levels of greater than 900 U/mL (P < 0.05) and in patients whose ascites volume was less than or equal to 500 mL than in patients whose ascites volume was greater than 500 mL (P < 0.05).Conclusion DUSP6 is related to the occurrence of ovarian serous carcinoma and is potentially related to the peritoneal metastasis of ovarian serous carcinoma. DUSP6 may be a new molecule for the early diagnosis and therapy of ovarian serous carcinoma and peritoneal metastasis. 1）P < 0.001 vs benign cystadenoma；2）P < 0.001 vs borderline serous cystadenoma. * Use Fisher’s exact probability method，and the rest analysis use chi-square test.